TLDR; Imagine never having to worry about saying “Verification” when you meant “Validation”. Well you can. Write down what the V-words imply, and then use those sentences you wrote down instead. I actually thought that IEEE STD 610 was the up to date version but when I went to IEEE, I found that 610.12-1990 has been superceded by IEEE 24765:2010. I don’t actually know what 24765:2010 says about “Validation” and “Verification” because it costs $450 and I haven’t seen anyone directly quote 24765:2010. I do wonder what Validation and Verification are specified to mean now. I find the words “Verification” and “Validation” unclear.Historically the words verification and validation have taken on meaning within Software and Project Management.You can find a discussion on wikipedia, but I think the two word summary definitions read as follows:* verification - meeting requirements* validation - meets needsThese words probably mean more than this to some people. I’ve summarised and paraphrased.I quite like dictionary definitions to help me understand words:* verification - noun “The process of establishing the truth, accuracy, or validity of something.”* validation - noun - “The action of checking or proving the validity or accuracy of something.”In this case the dictionary definition didn’t help me distinguish between the two words very well since they are both defined in terms of the same underlying words e.g. validity, accuracy.And they are both nouns to describe processes (things we do).Clearly common ‘usage’ of these words provides the difference for Software Development and Testing where such a difference is important.And the difference betweeen things we do often arises from what the outcomes are, and the context that surrounds them (where, when, who). The important difference of the IEEE /PMBOK usage of Verification and Validation does not appear to come from “process/action” or “truth/accuracy”. It appears to come from the distinction between requirements and needs.But this can also lead to ambiguity since some requirements covers the ‘needs’.Need:* I need the TV to show me a clear picture and have audible soundRequirement:* TV should show clear picture* TV should have audible soundWe proceed to refine the requirement to define what ‘clear’ means: refresh rate, refresh frequency, colours, resolution, etc. And the same for sound.But we may have refined it for a specific person’s need, rather than everyone’s need i.e. people hear sound differentlyTherefore, are we actually splitting Requirement and Need across two different words to remind ourselves of gaps and ambiguities? * our requirements might not completely cover all identified needs* needs may exist that we haven’t represented as requirementsOur requirements may not be complete. Do the words “Verification” and “Validation” remind you of that?If we concentrate on ‘needs’ then we selectively choose which needs to meet and we recognise that we have interpreted the statement of need, and we may have ambiguity in our interpretation.And we know that the needs and requirements don’t just come from ‘users’. They come from stakeholders as well. And sometimes stakeholders supply them because of regulatory requirements. etc. etc.We have a rich set of source input models which contain ‘needs’ that we convert into ‘requirements’. 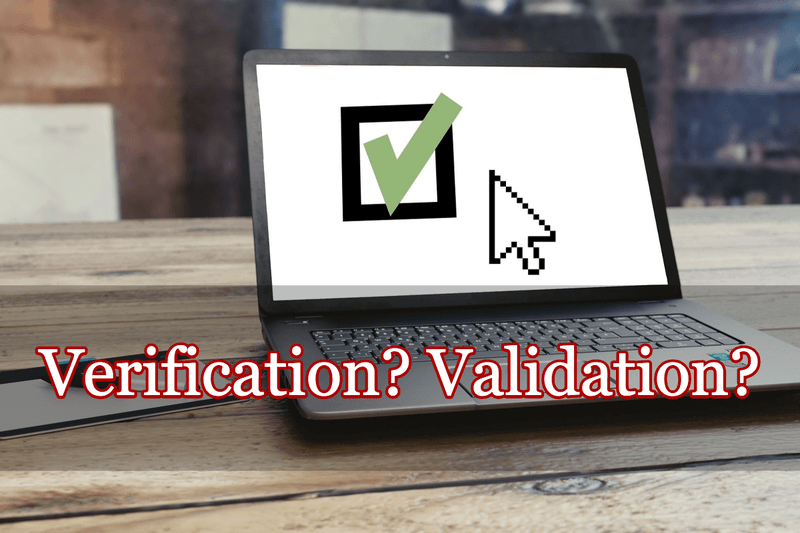 Do the words “Verification” and “Validation” remind you of that? I found the following on page 13 of the ISTQB foundation certificate syllabus version 2018. To paraphase:* “verification - checking whether the system meets specified requirements”* “validation - checking whether the system meets needs in operational environments”This maps on pretty well with the PMBOK definition quoted on WikipediaUnfortunately I think we’ve been led to a point where we have raised the importance of the terms “Verification” and “Validation” such that we might try to twist our understanding of Software Testing around these words.Rather than using notions implied by the definitions as inputs to our test approach. e.g. notions of: explicitly specified requirements, implicit requirements, usage needs, environment specific scenarios, stakeholders, specific data used, risk of ambiguity in requirement specification, risk of gaps in requirement gathering, etc.I wonder if a danger exists that, an industry might be trying to justify the continued use of the words Validation and Verification despite the lack of clarity offered by the words, rather than evolve clearer ways of communicating the underlying issues and concepts. I could ignore the words “verification” and “validation” and instead say. But I don’t want to just ‘check’.If I just ‘check’ then I find out that it “can” or it “can’t”. But really I want to build it so that it does. And then I might want to double check that I really did build it, but I might choose not to, it becomes a Risk informed decision what I choose to check and what I don’t. Note: I originally wrote “does” or “doesn’t” but this seemed a tad too definite and absolute. i.e. it always does. “Can” suggests the possibility that under some specific circumstances it can do it, but we have no way to be absolutely sure. And that lack of absolute certainty feels more like the world of Software Testing to me. I can build a Test Approach that wraps around this, helping mitigate Development Process gaps or risks. And avoiding certain approaches to testing which we believe we have tightly controlled. I have seen people rephrase Verification and Validation as:* Are we building the right thing? * Are we building the thing right?see also Software Verification and Validation _for more details._If I try to directly map these questions as people seem to use them:* Are we building the right thing? * Validation* meets usage needs* Are we building the thing right? * Verification* meets requirementsI don’t think the questions map directly on to the words Verification and Validation as I think the questions cover more ground than the V words.My twenty second attempt at mapping:* Are we building the right thing? * Validation and Verification* meets usage needs* meets requirements* solid business case? * is there a demand for this? * are we targetting the appropriate platform? * etc. * Are we building the thing right? * do requirements match needs* are we continually checking this? * good enough process? * are we introducing errors? * avoiding waste? * cost effective? * team skills? * etc.I appear to have interpreted these questions in an an unconventional way according the the normal mapping on to Validation and Verification that I find on the Internet. _This may have resulted from my personal inability to use the words Validation and Verification as per the standardised industry norms._I think the interpretation above offers me more value than a constrained mapping to Validation and Verification. **I’d rather use the questions for expanded definitions and concept exploration instead of proxies for Validation and Verification, as the expansion guides me towards a better development approach. **I think that this also moves me away from Verification and Validation and into the realm of “Quality”. Juran’s book then goes on to define these terms in more detail and continues to explore the concept of Quality in much more detail.Juran also discusses the concepts of Quality Control and Quality Assurance.I find a lot of goodness buried in this book but to follow that now would provide a distraction too far from the V words.To be fair to ISTQB Foundation Syllabus they have a section that touches on Quality - assurance and control. The Syllabus section doesn’t attempt to map back to Validation and Verification. I don’t plan to critique this section here. I just mention it exists in case people think I’m picking on the Syllabus. I’m not picking on the Syllabus here. I’m using the Syllabus because it is one of the few free publicly available ‘standard’ type documents. People will use it to learn about testing. If they do, they may develop a high importance weighting on the terms Verification and Validation. Why did I pick Juran? Because he concentrated on two main meanings.And people rephrase Verification and Validation into two questions.And Validation and Verification are two words.Do they all map directly?No. I don’t think so.But we can clearly find a lot of overlap between:* Are we building the right thing? * Are we building the thing right? * verification - meeting requirements* validation - meets needs* quality is meeting needs to provide product satisfaction* quality is freedom from deficienciesI personally think it is a useful exercise to work through the bullets and expand them for yourself as to what they might mean and how you interpret them. Recommended Exercise: work through the bullets and expand them for yourself to identify what they might mean to you, and how you interpret them. As a short example:* Freedom from deficiencies* how would we know? * How could “deficiency” be defined such that we would know? * Requirements specified to the level that can be reliably checked without ambiguity? * could deficiencies still exist? * requirements don’t cover everything then* etc.Juran summarised 1000+ pages and several other books into his ‘two main meanings’. I don’t think he intended them to be complete. I think he wanted them to be explored and interpreted on a contextual basis. I’m less convinced that Validation and Verification were presented in PMBOK and IEEE standards as ‘things to be interpreted’. Validation and Verification seem to be default words that The World of Software Development and Testing uses to describe ways of evaluating things.Despite recognising that the words are very similar and the usage they are being put to is very nuanced, The World of Software Development and Testing continues to use those words, rather than finding different ways of communicating.To clarify the use of the words, The World of Software Development and Testing, write articles to explain those words so the nuances can be understood more clearly by people in that world. I guess I’ve tried to do that too. I don’t use the terms Verification and Validation. I haven’t used them for some time. I didn’t find that they helped me think about Software Development and Software Testing.I make a special effort to take responsibility for how I think about and communicate testing.I don’t think I should just use glossary based terms by default. If I do use them, I need to make sure that the people whom I say them to, actually understand them in the same way that I do.